We are not yet sure if Gulaab Gang starring Maduhri Dixit and Juhi Chawla is based on Sampat Lal Devi’s life. But who is this lady clad in pink engulfed in controversy? She is the storm that takes you by surprise, Sampat Lal Devi founded the Gulabi Gang in 2006 in the Banda District of Uttar Pradesh in Northern India. Daughter of a shepherd, in early childhood she tended the goats and cattle but yearned to go to school. Sampat taught herself to read and write, learning from her brothers who went to school. Seeing her enthusiasm for education, one of her uncles took the initiative to enrol her in school. After having studied up to the fourth standard, she was married to an ice-cream vendor at the age of 12. At 16, she opposed a neighbour beating up his wife regularly; she motivated women in the area to teach the man a lesson. They let him go only after he apologised in public. In 2006, she started Gulabi Gang, which developed into an organized women’s movement with tens of thousands of members spread over several districts in Uttar Pradesh. 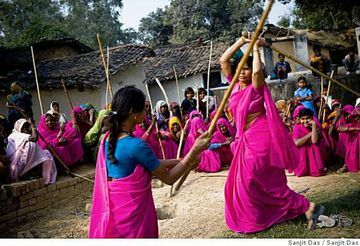 The women members wear pink saris and arm themselves with bamboo sticks, which they use whenever they come up against violent resistance. In 2003, three years before she formally set up the trust, Sampat helped Prema Rambahori, a dalit woman, set up a leaf-plate making business in Bangalipura community of Badausa village, a tribal area barely 15 kms away from Gulabi Gang’s “Karyalay” (office in Atarra). These environment friendly plates are sourced by adjacent towns and communities for weddings and various other occasions. 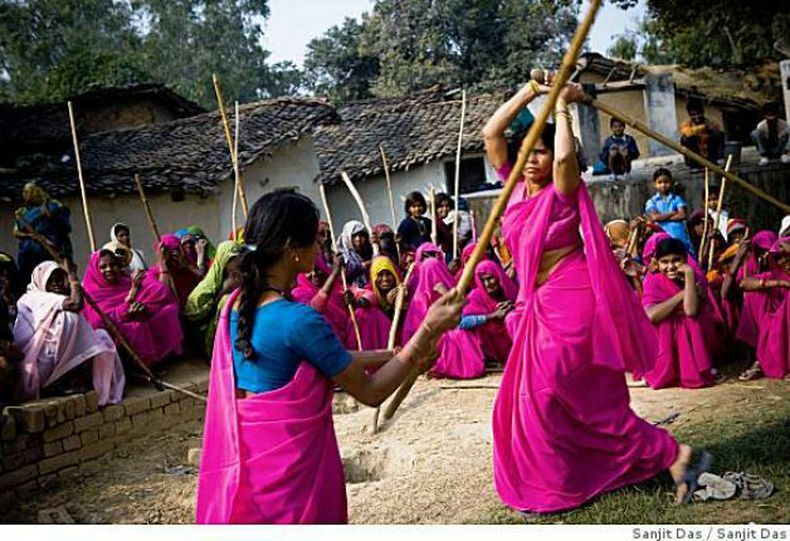 In the years that followed, the Gulabi Gang stopped several child marriages, forced the police to register several cases of domestic violence and raised its voice against dowry and female illiteracy; it also empowered its members with a great sense of belief in their own strength. In spite of opposition from their families, the women kept signing up as members. The pink sorority is not exactly a group of male-bashing feminists, men like Jai Prakash Shivhari are a part of the gulabi gang and they talk passionately about child marriages, dowry deaths, depleting water resources, farm subsidies and how funds are being stolen in government projects. In the harsh lands of Uttar Pradesh where nothing seemed to work for the Dalit women, Sampat Pal Devi did a commendable job. 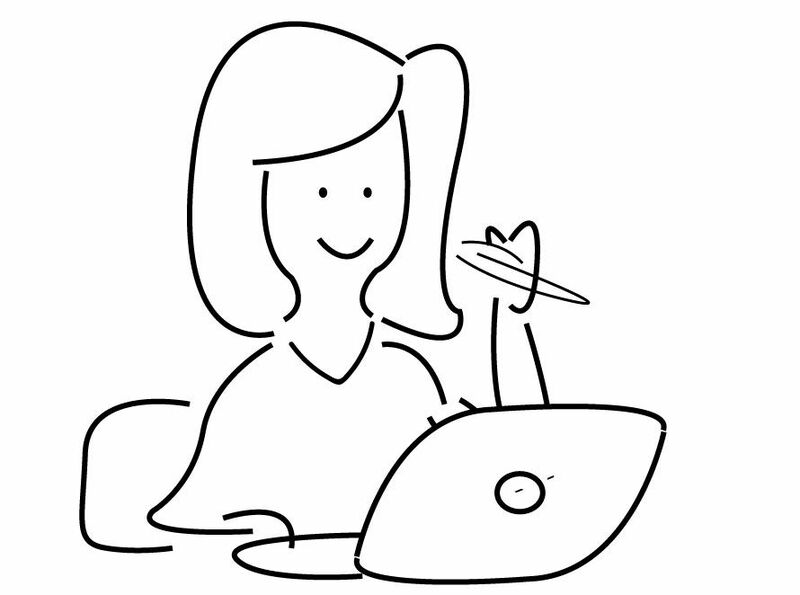 This women’s day, step out to do what you want, let nothing stop you, stay inspired and keep inspiring. Here’s wishing you ladies a Happy Women’s day.